Standby Systems is pleased to announce the launch of Riello UPSNextEnergy product. This highly innovative, transformer-less, three-phase UPS range with VFI SS 111 double conversion technology, IGBT converters and three-level control, is designed to meet power requirements of the future. The state-of-the-art technology and the careful selection of high quality components contribute to NextEnergy’s “best in class” performances: with unity power factor (kVA = Kw) and ease of supervision making it the perfect solution for electrical continuity of any “mission critical” application. With a smaller footprint, the ease of connection from top to bottom, and full front-end only accessibility for maintenance, it ensures optimal space utilization and allows wall-mounted back-to-back installation. The Riello/AROS NextEnergy can be installed to deliver peak lopping by supplying additional power required from the batteries. 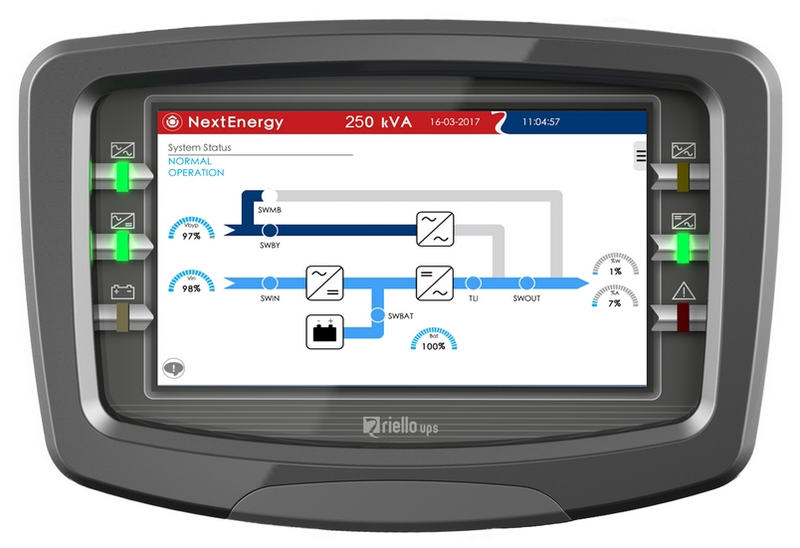 The 7 “color touch screen LCD display, communication slots, relay boards and specific service connectors simplify the configuration, control and supervision of the UPS by making the RIELO AROS NextEnergy easily integrated with infrastructure management systems, Data Center Infrastructure Management (DCIM) and an ideal solution for the electrical continuity of any IT applications.